Gosh it’s been a long time. I’ve done TWO whole plays at Theatre 40 since my last update! 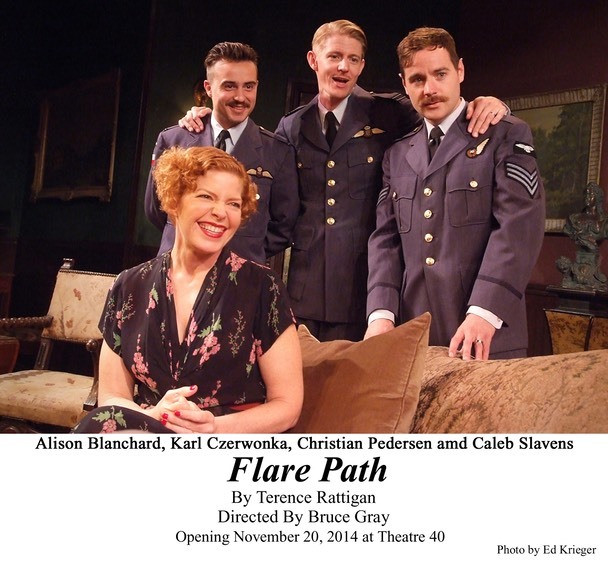 The first was Flare Path, by Terrence Rattigan. Written from the author’s own experiences as a tail-gunner in the RAF in the early years of WWII, it’s a lovely ensemble piece full of humor, heartbreak, and the real terror of war. I played Countess Doris Skriczevinsky, erstwhile barmaid, now married to a Polish Count. She lives with the Squadron and some of their wives at the Falcon Hotel, a run-down little place hard by an airfield in Southern England, just across the Channel from France. We had a wonderful cast, director, and crew, and everyone agreed it was one of our favorite theatrical experiences ever. I didn’t have the biggest part, but for me it was the BEST part, as Doris had a fabulous character arc and so many colors to play. We got wonderful audience response, and some lovely reviews as well. It’s so gratifying to be part of a really great piece of theater. What a blessing! The second was Accomplice, a comedy-thriller written by Rupert Holmes, he of “the Piña colada Song”, Escape. Crazy, huh? It has NOTHING if not one twist after another, keeping the audience on their toes all the way up to the VERY end! This play is not as much of a great piece of art as was Flare Path, but it is fabulously entertaining. It has a very small cast (only 4 actors), but here I was the lead again, hardly leaving the stage for a minute. We all had a fabulous time with the lightening-fast repartee, and the cast, crew, and director were all, again, peerless. The audience loved every minute of it, and we just had a ball doing it. I’m really getting spoiled with these fabulous roles in wonderful shows! Of course, I wouldn’t have it any other way. I’m eagerly looking forward to the next opportunity, and I promise I’ll update the page sooner in future! Hope you’re all having a fantastic summer. My husband and I are going to beautiful Down-East Maine for a vacation in a week or so. The very most beautiful spot ever! Can’t wait.